"Over The Rainbow" / "Belonging” / "Spiral" / "Tough Love"
Looking back over this fifth Buffy season, I haven’t really been the hugest fan of the two episodes credited to writer Rebecca Rand Kirshner, except in spots, and now we get Kirshner’s “Tough Love,” which may be my least favorite S5 episode. I don’t mean this as a knock on Kirshner. She went on to work on Gilmore Girls, another show I love, and I know she has more Buffy episodes to come, and perhaps those will be better. But “Tough Love” was so off that it briefly made the whole season—and in some ways the whole series—feel like it’d gone way off the rails. Part of the problem is that the episode is primarily mechanical, not dramatic. It’s designed to update viewers on the status of several key characters as we approach the finale. We learn that Buffy’s had to take a hiatus from UC-Sunnydale in order to focus on taking care of Dawn; and we learn that Dawn’s been skipping school, not really seeing much of a point to continuing her education what with her being an artificial construct with a dead mom and all. We also learn that Ben’s been let go from his hospital gig because his transformations into Glory have been keeping him from getting to work, and that Glory is pushing her minions to work double-time to find The Key. And because it’s a little too early for Glory to realize that Dawn is The Key, “Tough Love” stalls by having Glory mistakenly go after Tara, and turn the poor girl’s brain to mush. Let me be clear here, because sometimes when I register complaints like this, some of you come back with, “But that’s how the character would behave in just that situation.” I’m not arguing otherwise. A few episodes back, when I criticized the way the show depicted Buffy’s reaction to the end of her relationship with Riley, I wasn’t trying to say that Buffy would never be so distraught by a breakup that she helped bring on herself; I was only saying that from my perspective as a viewer—as written, directed and performed—the scenes of her bursting into tears didn’t work. They were jarring, and not in a “sometimes life is jarring” kind of way, but a “the creative team of Buffy The Vampire Slayer has lost control of the moment” kind of way. Similarly, while I buy everything that happens in “Tough Love” in the abstract, the actual hour of television wasn’t exactly entertaining… not in “sometimes life isn’t entertaining” kind of way, but a “boy, this is poorly written and paced” kind of way. “Spiral” is a significant improvement over “Tough Love,” though not at first. The previous episode ends with Glory storming into the UCSD dorm and finding out from the melty-brained Tara that Dawn is the key. “Spiral” begins with Buffy trying to fend off Glory and succeeding only when Glory gets hit by a truck and turns into Ben. In the wake of that narrow escape, Buffy decides that she’s had one close call too many, and orders the whole Scooby team to load up into a Spike-driven Winnebago and skip town. And I thought to myself, once again, “Oh great, another delaying tactic.” I felt like Willow at the end of “Tough Love,” wanting to ask when, exactly, would it be okay to go on offense and take down this mad God who’s tried so many times—and, more importantly, failed—to kill our heroes. It didn’t help my mood either when during their exodus from Sunnydale, Buffy took time to bully her friends into accepting Spike’s presence and to deliver a maudlin speech to Dawn about what it means to be The Slayer. When did this show become so dreary? But then, just when Buffy says, “At least things can’t get any crazier,” things, thank Glory, start getting crazier. The Knights Of Byzantium chase after the Winnebago on horseback, leading to a thrilling fight sequence like something out of on old-timey western, complete with Buffy fighting atop a moving vehicle. 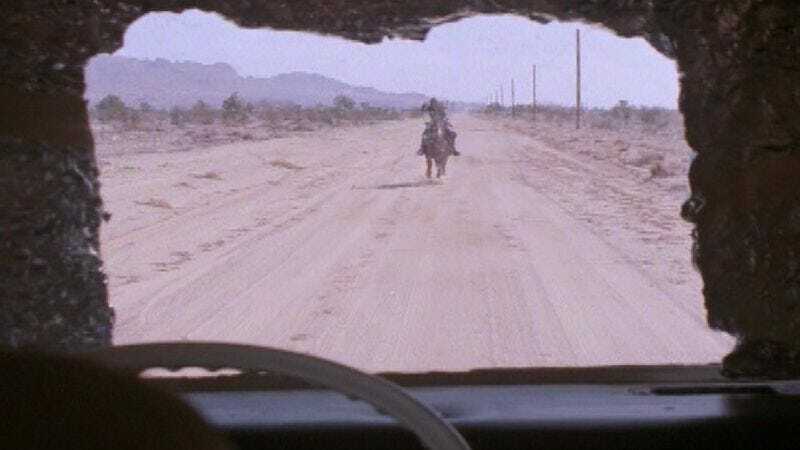 During the battle, Giles gets impaled and the Winnebago tips over, so the gang holes up in one of those abandoned gas station/diners that apparently populate every square mile of desert out west, just in case a horror and/or action movie needs a cool-looking set. The Knights attack, but Willow throws up a force-field, with the Knights’ main general still inside. And when Buffy determines that Giles need medical attention, she calls Ben. This is smart storytelling all around, from the catalyzing pressure applied by the Knights to Buffy’s inadvertent decision to bring the enemy she’s hiding from right to her door. Credited writer Steven S. DeKnight also takes advantage of the intensity of the second half of the episode to deliver a whole bunch of Glory backstory: explaining how she was cast out of her dimension and embedded in the body of a mortal male who would’ve grown old and died if Glory hadn’t reasserted herself from within him. If you put that info-dump into a more relaxed moment, it wouldn’t work as well, but having the Knights’ general tell the story while his men wait outside with weapons drawn and Giles lies mortally wounded… well, let’s just say that the episode already has our attention. “Spiral” also deepens the themes of the season by setting Ben’s reaction to his lot in life against Dawn’s. When one of Glory’s minions tells Ben that his life was never really his, he says, “It doesn’t matter how I came by it, it’s mine.” Contrast that with Dawn, whining about how she shouldn’t exist; or compare it to Buffy, standing up for Dawn by hissing at the general that it’s not Dawn’s fault that she’s The Key. This is what Season Five has been exploring: the malice that creeps over us no matter what we do, and the malice that we partly bring on ourselves. Buffy brings Ben to the desert, where he changes into Glory and snatches Dawn. And when Buffy tries to run after her, she’s blocked by the wall that her own team created. Sometimes there are obstacles in front of us that we don’t deserve, and sometimes… we conjure them. I’ve already expressed my affection for Lorne (who officially got a name in this week’s episodes, by the way) and the reasons for same, so I probably don’t need to tell you how much I enjoyed the line above. And though I know Angel fans are largely split on whether the season-ending trip to Lorne’s world, Pylea, is charming or corny, I have to mark myself down as a fan, at least so far. “Belonging,” which sets up the whole adventure, is somewhat disjointed, though effective at establishing both the narrative and emotional reasons for the journey. After a dinner celebrating Cordelia landing a national commercial, the gang scatters a bit. Wesley calls his father to wish him a happy birthday, and tries to tell tells him about his new job but gets shut down by his dad’s skepticism. (“No, I certainly won’t be fired,” Wesley says. “Yes, I was that one time.”) Wesley envies Gunn for having relationships outside of their immediate circle, but when Gunn joins Angel and Wesley on a demon-hunt, one of Gunn’s best friends gets bit by a vampire and has to be put down, prompting a crisis of conscience for Gunn. (Though between you and me, if Gunn’s friend had just waited like Gunn asked him to, he’d probably still be alive.) Angel is showing an increasing inability to relate to human beings, whether he’s stopping a stranger in a restaurant and accusing her of being a witch or he’s endangering Cordy’s commercial gig by wandering around its fake beach set, soaking up the pretend sunshine. In the midst of all this, Lorne arrives asking for the team’s help in tracking a malicious, human-hunting demon who appeared suddenly via a portal at Caritas. Following the trail leads the team to a library, where they hear about a librarian named Fred (short for Winifred) who disappeared years ago while handling at an ancient tome. Cordelia finds that book and reads from it, and suddenly a demon who looks a lot like Lorne—only less stylish—appears through yet another portal. It’s Lorne’s cousin Landok, who explains that before Lorne was transported from Pylea to Earth, he was already considered a weakling and an outcast. (Lorne says in his defense that he couldn’t stand living on a world without music, where everything was seen as “good” or “evil.”) Landok helps the team track and slay the man-eating demon from Pylea, and then they return to Caritas to read from the book again and send Landok back through the portal. Only when Landok disappears, so does Cordelia. From there, “Over The Rainbow” serves up one bright, funny scene after another: Wesley playfully poking at Angel’s face when they realize that the ordinary vampire rules don’t apply on Pylea; Angel soaking up the sunshine and saying, “Can everyone just notice how much fire I’m not on?” and, “There’s some branches over in that patch of sun. I’ll get ‘em!”; Lorne warning that they’ll need to keep a low profile, lest they “get beaten to death with sticks;” Wesley leading the charge against the attacking locals and yelling, “I think we’re winning!” before a smash-cut to the whole team in shackles; Gunn trying to make himself feel better in the dungeon by suggesting that the chains they’re all in are made from “some kind of magical alloy,” which is why they can’t break them; and, of course, the big reveal that Cordelia’s been promoted from work-cow to royalty after the Pyleans learn that she has visions. That’s just fun all around, and functional too. In “Belonging,” Angel emphasizes the different rituals that people go through in order to identify themselves as part of something larger than themselves, and then the episode shows how our heroes have become dissatisfied with those rituals, be they a call home or a Hollywood dues-paying or an actual, literal occult ritual. So in “Over The Rainbow,” the heroes get a little vacation from the lives they find unfulfilling, and—so far at least—get to reaffirm their commitment to each other by standing together against a common enemy. Plus Cordelia gets to put on pretty clothes and be waited on hand and foot. It’s like the ultimate spa day. -Speaking of pining for the past, the brief scene of Willow consulting with Giles in “Tough Love” reminded my how much I missed that relationship, from back in the high school library days. I know that in real life people change and grow apart, but it’s still a bummer. -Dawn eats a salami and peanut butter sandwich, which is like the kind of food teens used to eat on old sitcoms and cartoons. I never ate weird stuff as a teenager (unless you count Kool-Aid powder straight from the can) and didn’t know anyone who did. Is there any truth to this old cliché? -Xander makes two references to Sgt. Rock in “Spiral,” which means he’s okay in my book, for life. -The Knights indicate that Buffy’s responsible for the death of 10 of their men. I have to admit, this concerns me. I know Buffy is defending her sister’s life, but the Knights are mortal, right? And Buffy’s not supposed to kill mortals, is she? -Angel, Gunn and Wesley saved some power-walkers from a demon, but one of the power-walkers conked Wesley on the head, saying he’d disrespected the demon’s culture. -Lorne doesn’t tell people his name because he’s green. Nobody but Angel gets the joke. -Lorne says he never checked into how he ended up on Earth. “Gift horse… mouth,” he says, while turning his head away and purposefully not looking. -What was up with that human that Lorne went to for psychic guidance? We’d never seen her before, had we? Will we see her again? She was sort of unexplained. -I do know however that we’ll be seeing more of Fred, who appears in flashback in “Belonging” and shares a brief conversation with Cordelia when they’re both work-cows in “Over The Rainbow.” I know she’s something of a divisive figure among Angel fans, but I have no opinion about the character, since she hasn’t done much yet. -Once again, I have to say how much I like the idea of portals in Los Angeles to other dimensions. All you have to do is know the right places and the right words. Sort of like clubbing. -Hey, it’s Jin! Wolfram & Hart wants to buy Angel’s hotel, and Daniel Dae Kim plays their emissary. Is it okay if I pretend now that any scene with Holland Manners or Gavin Park is taking place in the sideways universe? -There are no gin-and-tonics in Pylea.